Frozen banana’s are wonderful! As I discovered over the summer when blended up in the blender the bananas turn into this magical, smooth, and creamy mixture that is similar to ice cream…WHAAT! So while I was Looking for a quick post work out treat I took that creamy banana mixture to the next level and made it into a delicious smoothie! Did I mention that this smoothie only has four ingredients! Yes, that’s it, only four simple ingredients and you are on your way to pure chocolaty, peanut buttery, banana bliss! Actually that is what I wanted to name this smoothie but I felt it was a bit too long, hehe. We absolutely love these smoothies and I have come up with a few tips to make the smoothie making…well…smooth! I find slicing the peeled bananas into pieces about a 1/2 inch in thickness for freezing, helps the bananas to blend more evenly. Because I make these all the time I have started freezing a couple of ripe bananas at a time, sliced and spread out on a parchment lined cookie sheet until frozen solid. Then I transfer the frozen banana slices to a labeled and dated freezer bag. 1 teaspoon of unsweetened cocoa powder (optional) I enjoy the extra chocolate flavor! *Feel free to use whatever milk you enjoy! If using a plain or vanilla milk, which I sometimes do you can simply add in 2 teaspoons of unsweetened cocoa powder to make it chocolaty! 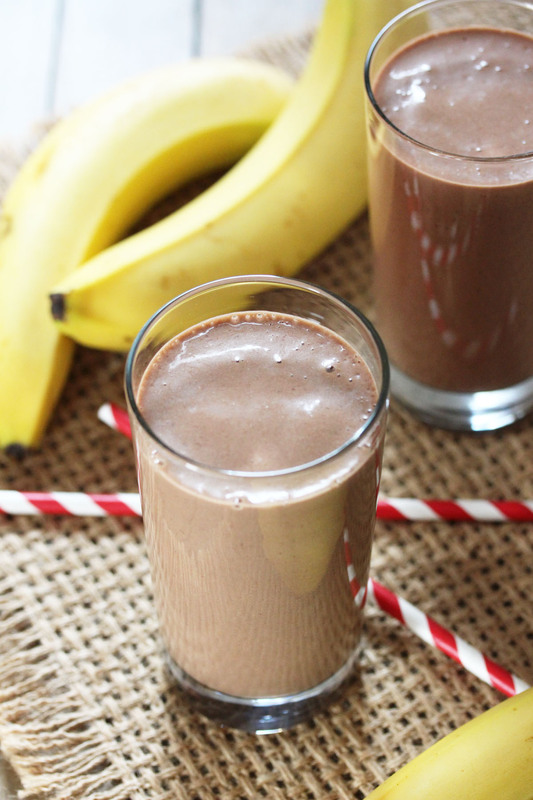 Place the banana, milk, peanut butter, and cocoa powder (if using) into the blender. Blend until smooth and thick. Enjoy!